Switzerland is renowned for its extensive banking and investment sector which comprises large universal banks, cantonal banks, and Swiss Raiffeisen (savings banks), in addition to the private banking and wealth management sectors. Most if not all of these banking and financial institutions have some degree of involvement in the Swiss gold market, and until the 1990s each of the three largest Swiss banks maintained an ownership stake in a Swiss gold refinery. Trading in the Swiss gold market is exclusively over-the-counter, and there are no central exchanges or trading venues. The Swiss Confederation is also the world’s largest importer and exporter of gold. This trading pattern is mainly due to Switzerland hosting the largest concentration of gold refineries in the world, whereby gold ore, recycled gold, and existing bar gold have to physically enter the country from around the world for processing before being exported again. The two current giants of Swiss banking, UBS AG and Credit Suisse, are central to both the historic and contemporary Swiss gold market, and their customers span central banks, gold producers and refiners, through to institutional investors, physical trade buyers, wealth management clients and other retail customers. UBS AG, through its London branch, is a London Bullion Market Association market maker in gold and silver spot, forwards and options and is a direct participant in the current daily LBMA Gold Price auctions. UBS is also one of the five members of the London gold clearing hub called London Precious Metals Clearing Limited (LPMCL), although it does not maintain its own precious metals vault in London. The distinct entities of UBS (Switzerland) and Credit Suisse AG (Zurich) are also Ordinary members of the LBMA in addition to their London branches being LBMA market makers. Both Swiss banks have historically been active participants in the gold lending market, and both banks currently offer gold deposit-taking services. In Switzerland, Credit Suisse trades gold on a spot and forward basis, and also trades gold swaps and options. The bank offers its customers physically allocated and pool allocated gold safekeeping facilities, as well as precious metals accounts (unallocated accounts). In Switzerland, UBS conducts a full spectrum of gold activities in the wholesale market, from trading gold on a spot and forward basis, to offering gold swaps, and interest rate swaps on gold, through to offering gold storage facilities and physical metal handling services. UBS AG was formed through the merger of Union Bank of Switzerland and Swiss Bank Corporation in 1998.
Credit Suisse has had a track record of upscaling and downscaling its activities in the gold market. For example, in 2000, Credit Suisse First Boston (CSFB) became a member of the then London Gold Fixing, but departed the Gold fixing a year later in 2001 as it cutback its precious metals business. Despite reports in December 2014 that Credit Suisse sold a large part of its commodities trading book to Citibank, along with its precious metals positions, Credit Suisse is still presently very much involved in the precious metals market, both internationally and in Switzerland. Today, Credit Suisse (London) is a London Bullion Market Association (LBMA) market maker in gold and silver spot and options markets, and trades precious metals forwards through its network of bullion banks – despite not being an official LBMA market maker in forwards. Zürcher Kantonalbank (ZKB), a Swiss universal bank and Switzerland’s largest cantonal bank, is headquartered in Zurich and is owned by the Canton of Zurich. ZKB is active in the Swiss gold market and gold can be purchased in any of ZKB’s branches. ZKB is also an Ordinary member of the LBMA and runs a physical gold ETF called the ZKB Gold ETF. Zürcher Kantolbank (ZKB) maintains a precious metals vault under its premises on Bahnhofstrasse in Zurich that in 2009 was reported to be storing approximately 40 tonnes of gold. Raiffeisen Bank cooperative is the third largest banking group in Switzerland after UBS and Credit Suisse. In a similar way to the Raiffeisen structure in Austria, which includes the Austrian Raiffeisen Zentralbank and Raiffeisen Bank, the Raiffeisen banking group in Switzerland consists of nearly 300 cooperative banks, with more than 1000 branches, with the ‘Raiffeisen Switzerland cooperative’ (headquartered in St Gallen) coordinating and supporting the banks in its network. Raiffeisen Bank trades precious metals and also offers precious metals accounts (unallocated) and physical precious metals to customers in its network. Bank Julius Baer, a private bank headquartered in Zurich, is an ordinary member of the LBMA and is active in trading precious metals on a spot and derivative basis. Julius Baer, through Bank Julius Bär & Co, Bahnhofstrasse, Zurich, is the custodian of the Julius Baer Physical Gold Fund, which holds nearly 50 tonnes of gold. Another private bank, Pictet & Cie, based in Geneva is active in the gold market for its clients, and is an Associate of the LBMA, and a member of the Association of Swiss Private Banks (L’Association de Banques Privées Suisses (ABPS)). ABPS is a 10 member grouping of prestigious Swiss private banks, located in Geneva. MKS (Switzerland) is a Geneva based precious metals trading and financial group whose clients include gold market participants such as banks and institutional investors. MKS (Switzerland) is part of the MKS PAMP Group, which is also highly involved in the physical gold market through its ownership of the PAMP precious metals refinery. MKS also owns New York based gold dealer Manfra, Tordella & Brookes (MTB). These three entities all have ties to the LBMA. MKS (Switzerland) is an Associate of the LBMA, the PAMP refinery is an Ordinary Member of the LBMA, while MTB is an LBMA Associate. Precious metals inter-dealer brokers Premex (or Prebon Premex), part of the Cosmorex AG group is located in Thalwil, in the Kilchberg area near Zurich. Cosmorex is itself a fully owned subsidiary of the extensive Tullett Prebon brokerage group. Premex was originally founded by the three banks of the Swiss gold pool (UBS, SBC and Credit Suisse), and nowdays Premex/Cosmorex operates in the inter-bank precious metals market, offering services such as OTC options, forwards and precious metals interest rate swaps to institutional clients. The Premex percious metals team operates trading desks in Dubai, Singapore and London, as well as in Thalwil. Prebon Premex is an Ordinary Member of the LBMA in the dealer category through the LBMA membership of Tullett Prebon London. German gold wholesaler/retailer Pro Aurum has 2 Swiss branches, a) Manno in Lugano in the canton of Ticino (near three large gold refineries), and b) in Kilchberg just outside Zurich. The Kilchberg branch of Pro Aurum has a vault in a former Zuercher Kantonalbank branch. Another German wholesaler/retailer, Degussa, has 2 branches in Switzerland, in Zurich (Degussa Goldhandel AG), and in Geneva. It is important to note that the ‘Big 4’ Swiss gold refineries have now internationalised everything from their ownership, to their customer base, to the markets they supply, and through to their worldwide operations. Swiss precious metals refineries are arguably ‘domestic’ Swiss concerns in name only, and should be considered international companies that happen to be located in Switzerland. Three of the four large refineries, Valcambi, PAMP, and Argor-Heraeus, are based literally a few kilometres from each other in the very south of the Swiss Canton of Ticino near the Swiss-Italian border. PAMP is in the village of Castel San Pietro, Argor Heraeus is in Mendrisio, and Valcambi is located in Balerna. This cluster of three refineries is sometimes known as Switzerland’s golden triangle, and it arose for historical reasons when the refineries were positioned there to be as close as possible to the then dominant Italian gold jewellery market. Today, the customer base of these giant Swiss gold refineries includes multinational mining companies, precious metals scrap dealers and recyclers, international commercial banks, central banks, governments and international financial institutions, as well as the luxury watch sector. BullionStar blog article “Swiss Gold Refineries and the sale of Valcambi” provides a detailed analysis of the ‘Big 4’ Swiss gold refineries. See also “From Good Delivery bars to Kilobars – The Swiss Refineries, the GFMS data, and the LBMA” for further analysis of the Swiss refineries’ role (particularly since 2013) in converting large London Good Delivery bars into smaller bars for the Asian markets. The Valcambi precious metals refinery is located in the municipality of Balerna in the Canton of Ticino. Valcambi is now owned by Indian gold company Rajesh Exports via a Singapore based holding company. Rajesh Exports acquired Valcambi in the summer of 2015. Organisationally, Valcambi is 100% owned by a company called ‘European Gold Refineries’, which in turn is 100% owned by ‘Global Gold Refineries AG’, which in turn is 95% owned by REL Singapore PTE Ltd, and 5% owned by Rajesh Exports Limited India. REL Singapore is Rajesh Export’s non-domiciled acquisition vehicle. Prior to the Rajesh Exports acquisition, Valcambi was owned by a consortium of Swiss investors and US based gold miner Newmont Mining. Historically, Valcambi was owned by Credit Suisse which had purchased 50% of Valcambi in 1967, another 30% of the company in 1968, and the final 20% in 1980. Valcambi has a combined precious metals refining capacity of 2,000 tonnes per annum, and an annual gold refining capacity of 1,400 tonnes per annum, giving it the largest refining capacity in the world. Even though Valcambi has been sold to Rajesh Exports, it remains headquartered in Switzerland and is run by the existing CEO. Valcambi’s existing customers such as Newmont, which has a number of long-term refining contracts with Valcambi, will continue to use the refinery for processing their gold mining ore output. Produits Artistiques Métaux Précieux (PAMP) is headquartered in Castel San Pietro in Ticino, and is fully-owned by MKS Finance (Switzerland) which is headquartered in Geneva. PAMP actually operates two precious metals refineries, one in Ticino and the other in Delhi, India. The Indian refinery is a joint venture with Indian state sponsored enterprise MMTC. MKS also owns New York based Manfra, Tordella & Brookes (MTB). MTB is a North American distributor for PAMP precious metals products. PAMP has a gold refining capacity of ~550+ tonnes per annum, and a silver refining capacity of ~1200+ tonnes per annum. Argor-Heraeus is located in Mendrisio in the Canton of Ticino. The refinery is jointly owned by German company Heraeus, German bank Commerzbank, the Austrian Mint (which is owned by the Austrian central bank), and Argor-Heraeus management. Originally, the refinery was established as Argor SA in 1951. In 1960, Swiss bank Union Bank of Switzerland (UBS) acquired an 80% shareholding in Argor, and increased ownership to 100% in 1973. UBS sold a 25% stake to Heraeus in 1986, and in 1999 UBS sold out fully leaving Heraeus and the company management controlling the entire shareholding. The same year Commerzbank purchased a 35% stake, and in 2002 the Austrian Mint bought a 24.3% interest. Argor- Heraeus has an annual refining capacity of 450 tonnes for both gold and silver. Metalor’s Swiss refinery is located in Marin-Epagnier in the Canton of Neuchâtel, in the north-west of Switzerland. Metalor also operates three other precious metals refineries, one in the US (North Attleboro, Massachusetts), one in Hong Kong, and one in Singapore. Metalor’s worldwide gold refining capacity is approximately 800 tonnes per annum. Metalor is owned by private equity group Astorg Partners, as well as a group of Swiss investors and Metalor management. Historically, Metalor was owned by Swiss Bank Corporation (SBC) between 1918 and 1998. The two smaller Swiss gold refineries, PX Précinox and Cendres + Metaux, are located in the north-east of Switzerland. PX Précinox is in La Chaux-de-Fonds near the city of Neuchâtel, and close to the French border. Cendres + Metaux is situated in the area of Biel, near Berne. Both refineries primarily specialise in refining recycled precious metals from sources such as industrial scrap, and supplying products to the medical/dental, jewellery and luxury watch sectors. However both refineries produce investment grade precious metals bars also. PX Précinox manufacturers a range of investment grade gold bars from small to large, and its ‘400oz bars’ are on the current LBMA Good Delivery List for gold. Cendres + Metaux was listed on the LBMA’s Good Delivery List for gold until April 2015, when it moved to the ‘Former’ list. The LBMA has appointed refinery assay laboratories from five member refineries to assist in the maintenance of the Good Delivery system. These five appointees are called ‘Good Delivery Referees’ and they meet four times per year. Three of the four giant Swiss gold refineries are members of the LBMA’a referee panel, namely Argor-Heraeus, PAMP, and Metalor Technologies. The only one of the 4 large Swiss gold refineries not on the LBMA Referee panel is Valcambi. The only other two precious metals refineries on this panel, are Rand Refinery of South Africa, and Tanaka Kikinzoku Kogyo of Japan. The fact that three of the five panel members are Swiss demonstrates the over-riding importance of Swiss refineries to the global gold industry. Like other gold refineries, the large Swiss gold refineries have dedicated precious metals trading desks which quote spot and forward metal prices to clients and that can trade gold and other precious metals for either allocated or unallocated (metal account) settlement. These trading desks also usually offer price hedging, location swaps, and financing arrangements. The Swiss National Bank is notable in that it still manages the 8th largest official central bank gold reserves in the world at 1,040 tonnes (7th largest in the world excluding the IMF). This is despite having sold off 1,550 tonnes of its gold in the 2000s, before which it held the world’s 5th largest official gold reserves (4th largest after France, Germany and the US, excluding the IMF). Note that in 2000, France still held over 3000 tonnes of gold. In 1999, Switzerland claimed to hold official gold holdings of 2,590 tonnes. During the period 2000 to 2004, the SNB sold 1,300 tonnes of gold under the first two Central Bank Gold Agreements. Following this in 2007-2008, Switzerland sold 250 additional tonnes of gold, bringing its total gold holdings down to 1,040 tonnes. Currently the SNB maintains that about 70% of its 1,040 tonnes of gold is stored in Switzerland, with roughly 20% stored at the Bank of England, and 10% stored with the Bank of Canada in Ottawa. The key point about the SNB’s gold stored in Switzerland is that the SNB will not confirm where this gold is stored, however it has always been assumed in the media that this gold is stored in vaults of the SNB under its headquarters in the city of Berne, where the Bank for International Settlements, through an arrangement with the SNB, also appears to store the gold that it maintains via its ‘loco Berne’ gold settlement and safekeeping facilities. The SNB’s headquarters building in Berne is on the Bundesplatz square, and the gold vaults are said to be under this building and stretching out under the square. The SNB has two headquarters, one in Berne and the other in Zurich at Börsenstrasse, and some media reports have said that some of the SNB gold is stored at its Zurich headquarters under Paradeplatz or Bürkliplatz, or else in commercial bank vaults under the famous Zurich banking street of Bahnhofstrasse. All of these locations in Zurich are adjacent to the SNB headquarters. In its role as the central bank for central banks, the Bank for International Settlements (BIS), headquartered in Basel, Switzerland, is a critical part of the international gold market and an often overlooked part of the Swiss gold market. in essence, the BIS acts as the gold broker to the world’s central banks. The BIS operates gold trading services from its Basel headquarters (and from its Hong Kong branch office) on behalf of the world’s central banks. These gold services include safe custody facilities and transactional services such as sight and term gold deposit (with central banks as the lenders), spot and forward purchase and sale gold transactions with settlement loco London, loco New York, loco Berne, and options and swaps on gold. The BIS maintains gold custody accounts with the Bank of England, the Federal Reserve Bank of New York (FRBNY), the Swiss National Bank (and historically the Banque de France), so central banks clients of the BIS can hold gold at these locations under the name of the BIS by utilising sub-accounts of the BIS gold accounts that are held at the Bank of England, the FRBNY, and the SNB. Gold held in custody (under earmark) by the BIS for central banks is reflected in the BIS annual financial accounts as an ‘off balance sheet item’. This balance sheet item totalled over 440 tonnes in March 2015. Gold on the BIS balance sheet represents gold deposits and swaps, and the BIS’ own gold. As of March 2015, the BIS held 108 tonnes of its own gold on its balance sheet as an investment asset, and over 350 tonnes of gold deposits on behalf of central bank customers. 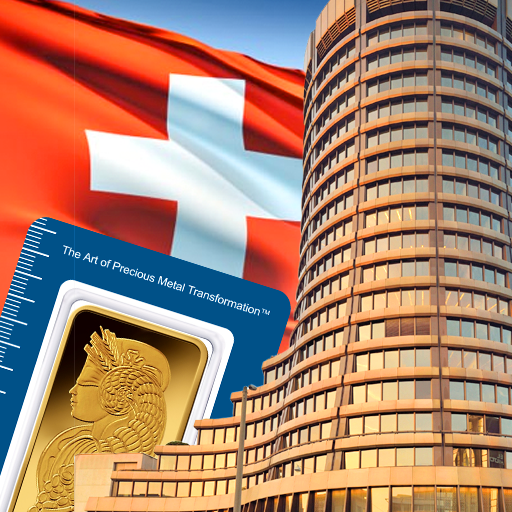 It’s unclear as to how much of the BIS’ own gold and custody gold is stored with the Swiss National Bank in Berne, as the BIS chooses not to confirm its gold storage arrangements when asked. The historic Zurich Gold Pool was a consortium gold trading arrangement between Union Bank of Switzerland, Swiss Bank Corporation and Credit Suisse which was active in the late 1960s /1970s. When the London Gold Pool collapsed on Thursday 14th March 1968 due to the US running out of Good Delivery Gold to supply the Pool with, the London gold market remained closed for the following two weeks, only reopening on Monday 1st April 1968. During London’s two-week market closure, the major central banks formed an agreement (the 1968 Washington Agreement) to cease intervening in the free market of gold, but to continue to trade among themselves at the ‘official’ gold price of $35 per ounce. During this two-week period, UBS, SBC and Credit Suisse formed a gold trading alliance and managed to convince South Africa, the world’s largest gold supplier at the time, to sell its gold directly to the three Zurich banks and not, as had been the case previously, to sell its gold on the London market. This alliance between the banks, and the direct gold flows from South Africa to Switzerland was successful in boosting gold business in Zurich, to the disadvantage of London. The actual trading mechanism of the Zurich Gold Pool consisted of a buying syndicate between the three Swiss banks whereby they quoted a coordinated bid price for their purchases, but the gold that was bought into the pool was then available individually to the three banks to sell to their respective customers at each banks’ own offer prices (i.e. common bid price, individual bank offer price). In November 2014, FINMA, the Swiss financial markets supervisory authority, investigated UBS for foreign exchange and precious metals price manipulation. FINMA “found serious misconduct of employees in foreign exchange trading and in precious metals trading”, including front running of client orders in precious metals. In December 2015, FINMA imposed bans on a number of former UBS precious metals and currency trader employees from holding various positions at firms supervised by FINMA. The ASFCMP, or ‘Swiss Association of Precious Metals Manufacturers and Traders’ in English, is a key part of the Swiss gold industry and represents Swiss companies that are involved in gold dealing and processing. The Central Office for Precious Metals Control is a regulatory body for the Swiss precious metals industry, that is part of the Swiss Customs Administration, which itself is part of the Swiss Federal Department of Finance. The Central Office exists to oversee the Swiss gold industry and to preserve its highly valued reputation. Essentially, the Control Office enforces the ‘Precious Metals Control Law’. In practice, this is done by ‘licensed assayers’ or “essayeurs jurés” who certify and maintain the quality of the precious metals produced by the Swiss precious metals fabricators. Some of these assayers work directly for the Control Office, others are employed by and work in the refineries. Looking at the branch locations of the Central Control Office is a good way to gauge where the most important participants in the Swiss gold industry are located. For example, there are Control Offices in Chiasso and Neuchatel near the large gold refineries, and also in the gold import and export hubs of Zurich and Geneva. Starting in January 2014, Swiss foreign trade statistics have included monthly non-monetary gold import and export statistics on a country level basis. Before this date, Swiss Federal Customs Administration only published gold import and export data on a quarterly basis, in a consolidated high-level (non-country) format. The Swiss Federal Council stated that the change was made to bring Swiss trade statistics on gold into line with international standards as well as to increase gold trade transparency. As part of the reporting change, historical (non-monetary) country level gold import and export data from 1982 – 2012 were also published. Monetary gold (i.e. gold held by central banks and official sector institutions) is exempt from trade statistics reporting in Switzerland and most other countries due to the secrecy with which central banks engage in gold related transactions. Switzerland imported approximately 1800 tonnes of gold in 2012, 2600 tonnes in 2013, and 1750 tonnes in 2014. The volume of Swiss gold exports each year is normally fairly close to the reported import volumes. Switzerland exported approximately 1600 tonnes of gold in 2012, 2800 tonnes in 2013 and 1750 tonnes in 2014. Although gold doré bars are imported into Switzerland from many prominent gold mining countries, the largest import source for Swiss gold is from the UK. For example, in 2014, Switzerland imported 624 tonnes of gold from the UK. These exports represent predominantly existing ‘Good Delivery’ bars being sent to the Swiss refineries for transformation into smaller bars (such as kilobars) for the Asian markets, In 2014, the top 5 countries importing gold from Switzerland were India (473 tonnes), Hong Kong (379 tonnes), China (221 tonnes), Singapore (135 tonnes), and Germany (91 tonnes). The Swiss gold market is historically the world’s largest physical gold market. Although other physical gold markets have gained prominence (e.g. China), or retained their prominence (e.g. India), Switzerland is still arguably the world’s most important physical gold market due to its role as the world’s largest gold refinery hub and the continued importance of investment gold to the Swiss financial and wealth management sector. Swiss gold import and export statistics provide vital clues in helping to track the world’s largest gold flows to and from the Swiss refineries, so its hugely beneficial that the Swiss Federal Customs recently saw fit to make this data more accessible. On the other hand, the monetary gold transactions conducted by that secretive Swiss based institution, the Bank for International Settlements, and its central bank customer gold storage details, remain completely opaque, and are a reminder that not everything in the global gold market wants to have a spotlight shone on it.